Starting today, US gamers will be able to pick up a 60GB PS3 for $499, which is the price point many have long predicted, but which Sony has consistently denied. 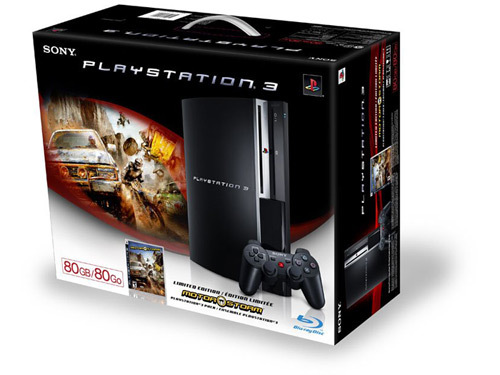 Moreover, In the US and Canada, the 80GB PS3 will launch next month for $599, which will include a copy of MotorStorm and - possibly - up to five Blu-ray movies, although the movie bundle has yet to be confirmed. The official word of the price drop comes in suitably intriguing fashion for a piece of news that has been surrounded in denials and obfuscation. KOTV, an Oklahoma local TV station, published on its website an embargoed AP story confirming the move several hours early. Whether it was on purpose or not is unclear, but it seems in keeping with Sony’s M.O. over PS3 pricing. Sony’s aggressive price cut comes in the week of the revamped E3 gaming show in California, at which Nintendo and Microsoft will reveal their latest strategies for their various games platforms.